The official English Cardfight portal updated with 50 more locations for the 2018 Spring Demo Caravan today, primarily in Canada. When the Caravan was first announced twelve days ago it comprised just 127 locations in total, and the new additions bring the total up to just over half of the promised 300+ shops. Most of the participating shops in the United States remain unlisted despite having already received their Caravan times; readers may do better by asking the managers of their local hobby shops directly to find out when the demo event is being held. Participants will receive a free Stardrive Dragon Start Deck containing alternate versions of cards found in the Royal Paladin Trial Deck, while its Kagerо̄ counterpart can be obtained at Bushiroad Spring Fest tournaments held on or after May 12th. 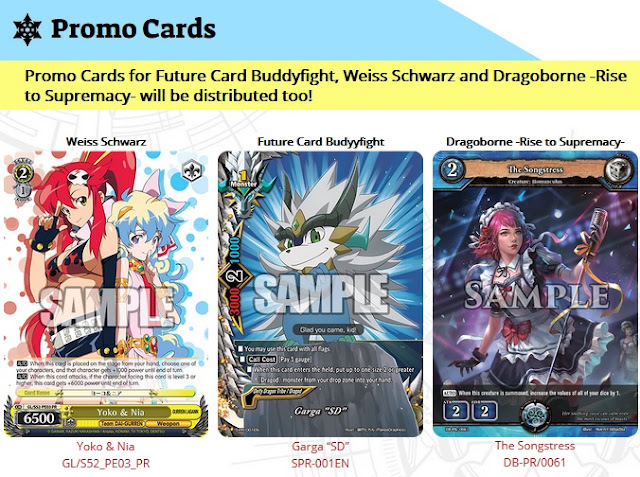 Additionally, the Caravan's Demo Caravan promos have been announced: Yoko & Nia for Weiss Schwarz, Garga "SD" for Buddyfight, and The Songstress for Dragoborne. While the Japanese format received a promotional Blaster Blade, no similar distribution has been announced for the English game.